This is a step-by-step guide to setting up a professional quality podcast recording studio for 2 people. Here is how it looks to use the system. You can hear the end result of this podcast here. This equipment will cost less than $300 but add 10x quality compared to a regular Apple headphone recording system. Should I Invest in a Podcast Recording Studio? If you’re serious about creating a podcast that people want to listen to, quality recording equipment is a no brainer. In my experience (after producing well over 200 podcast episodes) quality is a huge differentiator from shows that are successful and those that aren’t. If you’ve come this far, you’re going to be investing a significant amount of time into your show. Quality should be high on your priority list. Especially since it’s so inexpensive. With all the time you spend recording, producing and publishing; the investment will pay-off many times over. I like the simplest software available. For Skype interviews, I use piezo. For in-person interviews and when recording alone, I use Audacity. The goal of this tutorial is to describe exactly how to create high-quality recordings. We’ll go through unpacking your equipment, plugging it all together, getting the free recording software and making your first recording. I take an Audio Technica ATR 2100 out of the box and explore everything that comes with the microphone. First a mic stand in 2 pieces that you get to screw together. Then we examine the XLR cable which plugs the microphone to the mixer (Scarlett 2i2.) The box also has a microphone and the USB cable in case you don’t want to work with a mixer like the Scarlett 2i2. We plug the XLR cable into the Scarlett 2i2 and the microphone to show how the microphone connects to the mixer. So you actually get to watch me build my podcast recording studio right in front of your eyes. Next we plug the mixer into the computer using a USB port which connects to the back of the mixer and the USB port of the MacBook (or whatever computer you have). I go over a quick little breakdown of how to set the knobs, switches and dials on the mixer. There aren’t a lot there, but walking through this short video will help avoid confusion in the future. I even show best practices for where the knobs should be set to make a quality podcast recording. After that, we get Audacity onto our computers as it’s an inexpensive and simple solution for making your podcast recordings on your own or with a live guest in the room. Of course, I’m a fan of simplicity. If you want to get some complex recording software, go for it. But don’t come whining to me when you fail to record because you don’t want to wait 10 minutes for your recording software to upload. I believe that simplicity is important for creators. When you get your flow state going, you don’t want to stop and fall down a rabbit hole of audio-geek complexity. While Audacity is loading up I do a quick demonstration of recording sound quality with, and without the mixer. Listen to the difference in the recording between the poor iPhone recording, the good USB microphone recording and finally the great mixer recording. After breaking down sound quality, we dive back into Audacity and I describe how to set each setting to record from the proper source. Also how to select where to have the recordings play back while you’re recording. Finally, I show how to make a split two channel recording and make it a mono track so it sounds professional. Sometimes people make the mistake of publishing L Channel audio and their shows sound rookie. You don’t have to worry about that because in the tutorial I teach you how to avoid this. Finally, I show how to export your recording so it’s high quality and ready to be shared with your podcast producer or with us. Special Note: When plugging your microphone into your mixer, use the far left XLR jack. I don’t know why, but it seems that the far left one is the one to use. Hey everybody, this is a podcasting recording studio tutorial. Today, we are going to show exactly how to take the recording equipment and set it up. Then we will record a podcast and share it with our producer using Dropbox. First off, you have your Audio Technica 2100 microphone. I’m going to set this up so you can watch this podcast recording studio come together now. Here we have a Focusrite Scarlett 2i2 mixer. This one works great for two channels when you’re live recording. Here we have a XLR cable. This is what the microphone looks like when it’s all set up, so right now we’re going to set up the microphone and plug it into the computer so you can see exactly how to have, how to set up a really nice recording studio. So, I’m just going to open this up. Audio Technica box up, right now. So these things come with as you can see right here, this is the mic stand. Screw the mic stand on like that, then stand it up, this will make it so you can operate it, with it from your desk. This is the XLR cable. This is the microphone. And this is the USB plug, so you really can just use this microphone with just a USB stick but if you really want the really high quality, you can go with the XLR cable. So after you’re done with the box, and then as you’re setting it up, if you want to set it up with the XLR cable, you just untie the cable. This end goes in here, so that’ll click, it’s on, and then this one goes into the mixer. You also want to get a pop filter. I got the colorful ones, so you can go with like, pink or blue or whatever, but most people will go with black, I think that that, um. But these actually will make a big difference in your recording quality. For these you just want to stretch them, pull them over as tight as you can, and then once they’re on, oh jeez, they don’t come off. There you go. So, to set it up, the Scarlett comes with the USB connector. You plug the USB connector, which is this one right here, into the back of the USB connector, and then you plug the thing into your computer. You’ll see this, when the lights on, let me explain real quick what all these are. These are the gains so when you’re recording you want to make sure generally putting these at about like three quarters, you can see, I don’t know if you can see it on the video, but the little nods are about pointing towards me, they’re like this, so you want to turn them at about three quarters. But with these, what you do want to do, is make it so that your audio average is in between like five and seven-five. The instrument ones don’t matter. This button, you want to make sure that this button is pushed in. This is what feeds power to the microphone. The monitor is unimportant unless you’re, you know, connecting to speakers. And then this is your headphone volume, so you can plug into here with the headphone jack, if you need, if you want to use your headphones from the mixer, you can just plug one of these in. Then these will go to a headphone. And then you want to have, you can get one of these, all of this stuff is listed in the blog post that’s linked underneath. But you can connect headphones into here, and then this will go into the headphone jack right there. And that’s it. Once you plug it in, we’ll go into the software, and I’ll explain that in the video right now. So I’m just going to show you guys quick and easy how to get recording with your podcast recording studio quickly. There’s various different softwares to use, but there’s a free one called Audacity. If you just Google Audacity, you’ll find that it’s the first one that comes up, audacity.sourceforge.net. If you go there, you’ll be able to download it. Bam, it’s very simple, it’s very inexpensive. And I like it because it’s such a simple program to use. I’ve already got it downloaded, so once you download it, you can just open it up like this. While Audacity is opening up, I’d like to just talk a little bit about the difference in quality between using the mixer, and using the USB. Right now, I’m actually using the USB connector to record this, right now. What you’re hearing is the USB. And in just a moment, I’m going to switch over to the XLR cable, powered by the mixer, so that you can get an idea of the difference in the way that it sounds. If you haven’t noticed, right now I’m using the Scarlett 2i2, as well as the ATR 2100, so this is actually the way that it’s supposed to sound, when it’s really nice. But anyway, once you get Audacity open, you want to make sure that you look at, that you find the record icon right there, and click this one and then go down to 2i2. Once that one’s built in, you can select either the built in, or you can use the Scarlett as the external one as well. Right now I simply have my headphones plugged into the computer, so I’m just using the built in audio to playback for myself. Once you’re done with that, once you’ve selected the proper driver, you want to hit the record button. Now you will see that it’s recording. The way that it records is on a two channel mixer, so that the top recording you can see here, is my voice, and as it goes along… if there was another person speaking into the other microphone, then the bottom one down here, the bottom track would be accepting that. I’ve just stopped the recording. “As it goes along, if there was another person sp—“ You see that it does it like that. Say this is your final track, and this is your first podcast, and you want to share it with somebody, you go to File, Export. Now I recommend exporting in .aiff file or in .wav files if you’re using a PC. So I’m going to export this one to the desktop. Then you’ll see that it’ll actually pop up right here once it’s done exporting. Record button, and now you can see that it’s record– You can share this one with your podcast producer or you can use that as a, as the raw materials to make your own show. And that’s how you do it. It’s really not rocket science once you see this video. And now if you’re ready to rock, you want to make sure the microphone’s turned on, which is this switch here. And then you can see, right here, it turns green because it’s picking up my voice. At this point, I’ve got my podcast recording studio ready to rock! If I turn the gain all the way up, you see that right now it’s peaking. So you want to make sure that the gain is down a little, and then when the gain is down, that’ll show that the audio’s not peaky. So you can get the best recordings possible. And that’s everything, that’s how you set up your own little podcast recording studio. This has been a Freedom Podcasting production. For more information, go to freedompodcasting.com. If you have any questions or would like to add something to improve this process for the next podcaster, leave a comment below. I’ve created a super high quality, step-by-step process for creating a podcast. I’m offering a substantial discount to people who read this page carefully. The reason for the discount is that you’re more likely to be a success story and produce a great show. You’re taking the time to read this, that tells me that you’re more dedicated than most. I can’t wait to listen to your podcast. Please share this post on Facebook, Twitter and LinkedIn if you found it useful. This is a really good writeup of a basic but good setup. I am interested in that little mixer because it is bus powered. I get a nasty ground loop hum from my mixer. Yeah as a full time traveler, having a bus powered mic is great because I can record on an airplane or while in the forest or on the beach. The versatility is important. You can take this system to conferences too and just have your laptop, the mixer and the microphones. It’s a great system. I am going to try out that little mixer. I’m very unhappy about the minor hum from my big mixer. It actually isn’t horrible, but I think my podcasts sound good enough now that I am very sensitive to those little hums. Using the two Audix OM2 dynamic mics I have, I have found I actually get a better sound plugging them right into the bottom of my Tascam DR-40 audio recorder. It has reasonable preamps, records to SD card, and can download to computer via USB. It is a nice option for mobile recording. I recorded this interview in a bar in Oak Cliff using that setup, with the internal mics picking up ambient bar noise. It turned out really nice. http://www.concretelunch.info/?cat=225 . All a scam.. I can talk right into my laptop, no mic, no head phones NOTHING. I just Windows Sound recorder and I will bet my audio sounds jus as good OR better than any podcast that uses all that equipment. No obviously a guy like Adam Carolla show will sound better cause it’s a real radio studio but any podcast where a dude wasted hundreds on a mic and head phones wasted money..My audio sounds just as good..
Just a note for those reading this, I never heard back from Steve. My guess is that he learned that microphones and mixers actually improve audio quality over built-in computer microphones. This is, of course, obvious. I know I’m late to the game here, but my friends and I have a podcast. One time, I remembered the mic but forgot the cable for it, so we recorded using the in-laptop mic. The difference was very obvious. You do, indeed, need the proper equipment. It’s not a scam. Thank you for listing this. My studio is now set up and it was as easy as you describe in the video. This was the best 300 dollar recording system I could find. Thanks for the great post. You rock. Thank you for the comment. Thanks for this. I’m using it for my podcast and it’s working great. you don’t need to use the phantom power for the atr 2100, it is a dynamic mic and does not need phantom. Agreed. But it sounds better when you do. This video was hugely helpful. One quick question–would it be the end of the world if I get the Technica mic and forgo the 2i2 mixer? Just going mic to USB in that case. I’m happy to hear the tutorial helped you. Thank you for the kind words. If you listen to the video at 5 min and 5 seconds, I switch the microphone from the USB plug to using the mixer. Please feel free to go back to the video and listen for that time stamp. Can you hear the difference? When I listen to that, I hear a considerable difference in sound quality. It’s deeper, richer and I want to hear the recording that was created with the mixer more. I recommend using the mixer (and the ATR-2100 microphone of course) to all my clients and friends. The reason is that, quality can make or break a show. As a podcaster, you will be using this equipment again and again in the coming months and years. You might record 1,000 hours of audio on the equipment you’re about to buy. Think about the compounding value of making that sound quality just 1% better. How will that overall value of increasing your sound quality look like over the course of the next 10 years? Again, thank you for the comment, I really do appreciate it. Please feel free to follow up. It makes me quite happy to hear this tutorial served you. I guess the honest answer is I don’t know yet, I downloaded audacity and it doesn’t pick up well at all without the mic. So I was thinking of starting with just getting the mic and using standard headphones. I figure I’ll figure our how/where to host/list the recordings on my blog then get the mixer if the response is positive. You may have mentioned this in the show so I ought go back and look before asking, but once I have the file recorded and on my desktop–where do you upload your podcasts to? You’ll want to upload it to a media server which you will point to with your podcast RSS feed. Then you submit that RSS feed to iTunes and other platforms. I’ll have something describing exactly how to do soon. I’ll update this and get in contact with you directly. Thanks again. I’m happy you found it useful. Thank you for the comment. Do you recommend picking up some sort of boom arm? Or is the ATR desk mount sufficient? What’s phantom power? Did I miss that? Phantom power is just power being fed to the microphones through the cables (in this case, XLR cables.) Why use the term? Because it explains that the microphones use power which is a trait of higher quality recordings. Third question: I’m just about to start podcasting. I just purchased everything you recommended. I was going to buy the atr2100 anyway. You sold me on purchasing a second as well as the mixer. Have you ever done a remote interview? How do you recommend I habdle that? I’m concerned the sound quality will be bad and I have several people I want to interview that are too far away for me to travel. Great to hear you’re progressing into podcasting. Here’s a tutorial for you showing how to conduct a remote interview. I am still having issues getting started. I want to do a podcast and looking to maximize my sound/setup. My podcast is with a friend over Skype and we would like to interview a third person over the phone. I have a MacBook Pro, TASCAM DR-40 digital recorder, Behringer X1204USB mixer, iPhone, headphones, and Audio Technica xlr mic. I will be using Skype Call Recorder on my MacBook. In addition, I would like to record the interview/podcast with my TASCAM digital recorder (in case Skype crashes). My plan is to only use Garageband for post editing. After the interviews/podcast is over, I will edit the files produced from Call Recorder using Garage Band, unless you suggest otherwise. Other notes, my co-host on Skype will be using a USB headset Mic. Please advise on how to best set up my equipment for quality sound. I look forward to your response. Thank you. Then do that step. Here is a tutorial discounted coupon for getting my course which describes exactly how to solve all the problems you alluded to in the previous message. Just wanted to express my thanks for creating this page and video. 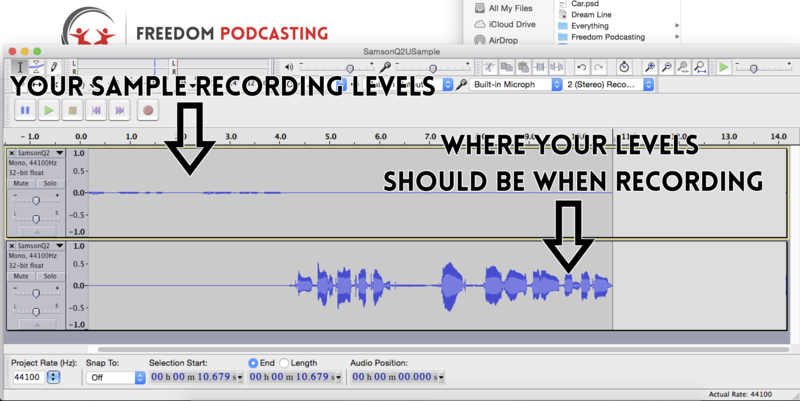 It has been the most helpful one that I have found in terms of “how to podcast with two mics” plus using Audacity. I’m a university lecturer and am starting to introduce interviews with “special guests” for my students. This has opened up a whole new world in terms of allowing me to access people who are influential in my field, as most are willing to be interviewed for a podcast, regardless of how famous! Thank you for the kind words Greg. I really do appreciate it. Thanks for talking about how to Set up a Podcast Recording Studio. It was really helpful and I liked it! Thanks for this. This was helpful. Thank you for commenting Ben. I want to start a podcast but was already getting anxiety as to the equipment and how to set everything up etc. YOUR BLOG POST AND VIDEO IS PRICELESS! Thank you so much. Thank you Trina. We’re happy we could help. Just a quick question – do you use the microphone/Scarlett Focusrite set up when you use piezo to record Skype calls. A rookie question, I know, but I’m brand new to all this. Yes, I use the microphone and Scarlett mixer to record Skype interviews over Skype with Piezo software. All of the Love Affair Travel podcast has been recorded like this and I’m about 60 interviews deep. What is the best way to record audio when you have a set up, but are doing an interview through Skype or Blab? Hey Elaine, I explain exactly how to record with Skype here. Hey Ian, what type of Headphones would you recommend that are inexpensive, yet provide great quality? I’m going to use the equipment you suggested, and start podcasting in January. I probably won’t be using Skype, so whatever you recommend for a simple studio headset. Any headphones will do. They don’t affect the recording quality as long as your microphone isn’t picking up their output. I always use stock white Apple earbud headphones. If you want to make an impression of professionalism on your guest, go with some comfortable noise canceling headphones. The beats by Dre sound amazing, but they are really expensive. Hi and many thanks for your video – I am still wondering about the value of the mixer – is it just a sound issue? and I agree that’s important but since I use a snowball mic plugged into my system to record on Audacity – I’m curious about the mixer and its purpose. I suppose when and if I buy one I’ll figure out to plug it in and make it work correctly. It’s a subtle difference and it’s possible that I’m overly sensitive to it because I work in this stuff all day. To me, it’s worth a one-time $250 payment for an even slightly better source recording. Remember, you’re recording with the intention that a lot of people listen to you for long periods of time. They will be driving their cars or going on runs and listening to your show. Just a marginal improvement will be felt and you might be helping them more than you know. That being said, the mixer is not critical. If you’re short on budget and that purchase is holding you back from getting started, by all means, go ahead without it. PS. By the way, I really don’t like the snowball microphone. It’s omnidirectional which means it picks up everything in the room. If you tap on your desk while recording, that microphone is going to pick it up perfectly. Hey Deb – The Scarlet 2i2 mixer has been my personal mixer for 3 years now without fail. I love it. I haven’t come across anything that works better for me. Please feel free to suggest a mixer for me to check out. If you do link it up below, I’ll buy it and do an unboxing/comparison video for you. Also, if it’s better than the Scarlet 2i2, I’ll buy you an extra one and mail it to you. 😀 Deal? If you buy it today, the 2i2 mixer is only $99 on amazon! I bought one this weekend, and it came in today. I think the sale ends today, though. On that note, based on your recommendations and others I’ve read, I got the 2i2 mixer and 2 Samson Q2U mics (which cost less than the atr2100 and come with decent headphones). I have it all set up and working with my macbook pro, but when I record in audacity, it is very low. How do I adjust this? I have the gain on the mixer turned up, but it still seems very low. Any ideas? Also, I know you have the atr2100, but it seems to function exactly the same as the Q2Us, so maybe you can help with this… I cant get any sound to work through the headphones when plugged direclty into the mic with an XLR connection. Does that only work for the USB connection? Could you please add an example of your recording to a DropBox folder and link it up here (please make it a short clip for easy editing)? I’ll check it out and let you know what I think. To answer your questions regarding why your levels are so low, perhaps you need to speak closer to the microphone. I know the ATR-2100 is best when you’re speaking within 2 inches of it. I will create a sample as soon as I get a chance and link it here. For the test I was actually right up to the mic trying to get it louder, but it still seemed very quiet. I do have the pop filter on it, but that shouldn’t make a difference, right? I’ll try a few more times this afternoon and make a sample recording. It’s possible since I’m alone and testing that maybe I wasn’t projecting my voice like I normally would while speaking/interviewing someone, so I’ll make sure of that as well. I’m brand new to podcasting, and I have only recorded one interview (using a Blue Yeti) and haven’t even edited it into the complete episode yet, but after recording once with the Yeti, I decided I definitely needed a more interview-friendly setup, so I wanted to try this out. Thanks for taking time to respond! It’s possible that you just need to project your voice a little more. That being said, you need to be able to speak comfortably when podcasting so if you have to have a uncommonly loud voice to podcast, you might want to get a more sensitive microphone. Send over that sample recoding so we can all check it out. I’ll host it off this site you don’t have to have it in DropBox forever. Thanks very much. It’s great to get examples of other microphones so we can make the best suggestions here. Sorry it took me a while to get a chance to record a sample. I like the microphone a lot. I wasn’t sure what to say, so I just introduced myself and listed all of my equipment lol. This was recorded sitting in my living room with the heater blowing very close by. I didn’t do any editing or normalization when I exported it. The microphone sounds good, but it’s hard to know definitively. Your issue right now is that your recording levels are way too low. Try to crank up the gain on the Scarlet 2i2. Also, if it’s already at full, you’ll just want to get your face right up close to that microphone. When I use the ATR-2100, I literally have it touching my chin. Great work. Keep going! Please let me know when your show is up. I can’t wait to hear what you come up with. My question is…. can’t I just use GarageBand instead of Audacity? Since I’m on a Mac and all that. Thank you. Sure you can use GarageBand to record. There are a lot of reasons I like Audacity more, but GarageBand will work fine. I’m on Mac too. I like Audacity more for recording because it’s simpler, faster and allows you to do more. I had my husband help me test with the second microphone and we adjusted the gain a bit and it sounds much better. I had it set at the 3/4 but had to bump it up a bit when I realized it wasn’t lighting up green when we talk and should have been. I adjusted it and we recorded another test and it sounded much better. Thanks! I do love the microphones, though. It is so much better than when I tried to record on the Yeti. Because I am not in a studio, that was way too sensitive for me. The TV came off mute in the background for a few minutes of our 2-mic test, and it wasn’t even detectable in our test. This is definitely the best setup. YES! That’s why I love this gear so much. You can record from lawn chairs along the highway (I might be exaggerating) and it will sound clear. Thank you for the delightful comment. Hi Ian – just discovered Freedom Podcasting and getting a lot of value already from your tutorials – thanks! Quick question – do you know if I can get studio audio recordings using your standard setup + an in-browser conferencing service like UberConference instead of Skype? Sure, you’ll sound great using that equipment. The other people on the recording who’s data will come in through the browser will only sound good if they too have quality recording equipment and everyone has good enough internet connections. I don’t know UberConference specifically so I can’t speak to that, but it should work. Otherwise, just use Google Hangouts or Skype. So happy to see this great content. Really appreciate it and it has been a big help in developing some additional confidence to launch a podcast. Inspiration comes from many places, none better than from familiar faces. Love you guys and love your work. After reading all the questions and answers, I’ve been inspired to ask one as well. Do you have content or a recommendation on where to go to learn more about the interview process of podcasting?? I’ve listened to thousands and have 5 favourite interviewers / podcast hosts. They all seem to be passionate, entertaining, educational, genuine, authentic & consistent. Just curious if there is a method / system to attracting and interviewing quests in particular?? If you mean the technical side, the course I put out on Udemy explains it to a T.
If you mean the emotional side…. well that’s a whole different game. Jimmie Fallon, John Steward, David Letterman, Karrie Gross, Adam Corolla, Joe Rogan… they are all so dramatically different. Truth is, these people are all just being themselves. I think that’s the real key to great interviews. It’s authenticity. 🙂 Great to see you on the interwebs Coach. Thank you for the comment. If you mean the non-technical side of podcasting, I’ve found a lot of useful information on transom.org. It’s the one site I’ve found dedicated to documentary style podcasting like This American Life, but I think a lot of the information is helpful and relevant to other Podcast styles as well. So if you haven’t looked over there, it’s definitely worth a visit. Hey Ian, I haven’t posted any finished episodes yet, but I’ve recorded more material with this setup, and I’m very pleased with it’s quality… And it’s even a relatively quick and easy setup when I go interview on location instead of at home. I highly recommend this mixer and mic combination. I also used a trial version of a software called Hindenburg that I LOVED. Have you used it? I want to get the journalist pro version, but it’s not in the budget yet, so I’ll probably have to stick to audacity for now. I’ve decided to go more documentary style (kind of), so the added features of the Hindenburg software have been very useful. The pro version includes a Skype recorder for those doing virtual interviews. I did want to ask if you always record in studio or if you take this setup with you places, and if you travel with it, then what do you use to store it in transit. What I’m using now is very temporary, but I was thinking a DSLR/laptop backpack may work since they have adjustable compartments I could change to fit the mics and stuff. Do you have any other suggestions? Thank you so much for this post! I have one question and hope you can help me out. I read about sound proof your room for podcast recording, but it was not mentioned in your article. Is it necessary to sound proof the room? if so, how to do it? Thanks. Hey Yujia – These microphones are great at only picking up the sound that is right in front of them. For that reason, soundproofing a room might not be quite as valuable as it was in the past with lower quality microphones. I have been teaching myself like CRAZY how to start and run a podcast. It has been a wild experience as I’m totally new to this world. This blog post is literally the BEST educational video and write up of anything I have found up to this point. I truly wish I had found it sooner. You became my hero today. I have hope again that I can figure this out. Thank you so much. Question: Your udemy discount code has expired. I’d really like to purchase it and take it. Do you have a current code? I want to continue learning from you! Thanks for this article. I’m scouring the web on advice for staging a three-person podcast (myself and two guests, in the same space). Would I just need a larger mixer (more inputs) and an additional microphone? Or would you have Another suggestion? Fantastic article. Buying some of the equipment and taking action!! YEHH! I bought the mixer and microphone on your list, but realize there is no jack to connect the two. Is there a specific thing to ask for, or would any type of jack work to connect them? This is a SIMPLE and WORKING post that actually helped me get confidence that podcasting can be that simple… keep up the good work!! Thank you Adhyan. I’m happy it was helpful. This tutorial was designed for those who just make the recordings and send those recording files to someone else who does the audio post production. There are a number of ways to combine both tracks, but the simplest version is to just split both sides to mono and export them. Audacity will ask you again something like, “are you sure you want to export, we’re going to mix them into one track” (paraphrasing here), you’ll say yes and your exported file will have both mono voice recordings exported into a single mono voice recording. This approach is problematic for a few reasons, but it’ll get you to the next step. If you want a post production video guide, check out the course (http://freedompodcasting.com/udemycta). In there I provide a detailed process for post production that ensures you’ll level the recordings properly and export them as a .mp3 file that is served well for podcasts. Thank you. I’ll definitely check out the Udemy course. Hi, I just recently purchased a Behringer USB Podcast studio, i configured the complete system as described in installation guide, But when i am attaching it with any software then after selecting recording device and all, Voice is not recording clearly, Voice quality is very poor and very distracted. I tried many software but all has same issue, Some of them are not able to record that bad quality voice even. I am using Windows 10 with Ableton Live Lite 9, AudoCity, Fluto etc.. But i am stuck. I need your help as i am not able to understand what is wrong with. All voice are coming clearly in headphone but not in recording softwares. I recommend getting the equipment listed above. I’ve played with the Behringer equipment before and have never liked it. I always had problems like the ones you have described. That’s why I stopped using and recommending it. I suggest that you get a refund or throw that old stuff away and get the stuff I list above. I bet you’ll be much happier. Thanks for the kind words. I would guess that the Scarlet 2i2 Mixer does everything you need. It’s easy to use, inexpensive and fairly durable. The Scarlet 2i2 is not an external audio recorder. You need to plug it into a computer or some other USB style recording device. Previous PostShould I Publish My Podcast at 64kb or 128kb Bitrate?